UNITED NATIONS, Sep 19 2018 (IPS) - The unpredictable Donald Trump, described by some as a human wrecking ball, will be walking down his own path of self-inflicted destruction when he visits the United Nations next week. The volatile American president’s unorthodox and reckless foreign policy has already reverberated throughout the United Nations: a $300 million reduction in funding to the UN Relief Works Agency (UNRWA) aiding Palestinians and a $69 million cut in funding, since last year, for the UN Population Agency (UNFPA), advancing reproductive health. And there is widespread speculation that the United States will also initiate a General Assembly resolution later this year to reduce its assessed contributions to the world body – currently at 22 percent of the annual budget. Making his second visit to the United Nations on September 25 to address the 73rd session of the General Assembly and later to preside over a Security Council meeting, Trump is known to hold the UN in contempt ever since he called for the renegotiation of the 2015 Climate Change agreement which has been signed by 195 countries and ratified by 180. In May, Trump also withdrew from the 2015 Iranian nuclear deal – the Joint Comprehensive Plan of Action (JCPOA)– while all other signatories, including France, UK, Russia and China, (four of the five permanent members of the Security Council), plus Germany and the European Union (EU), refused to follow his destructive path. And he once denounced the UN as just another “social club” – a remark made through sheer ignorance than a well-thought-out diplomatic pronouncement. The world body is expecting more upheavals from an erratic political leader who has kept the international community guessing – not excluding the United Nations. Norman Solomon, Executive Director of the Washington-based Institute for Public Accuracy, told IPS: “The world is too large, too diverse and too wondrous to have the foremost world body held hostage by the United States government. Trump’s jingoistic arrogance has dragged powerful discourse to new lows at the United Nations”. The madness of Donald Trump, he pointed out, is shocking on a daily basis, but his administration is an extreme manifestation of what the UN has all too often tolerated in previous times, in more “moderate” forms from Washington. “The time has come — the time is overdue — for the United Nations to clearly distinguish its operational missions from destructive agendas of the U.S. government,” said Solomon, Co-Founder and Coordinator of the online activist group RootsAction.org, which has 1.4 million active online members. Meanwhile, as part of his contempt for the international trading system, Trump has threatened to withdraw from the World Trade Organization (WTO) in Geneva as he continues to break trade agreements and impose unilateral tariffs. Still, he has his adherents out there in Washington DC. Stephen Moore, a senior fellow at the Heritage Foundation, has proposed that Trump should receive the 2018 Nobel Prize in Economics, since the much-coveted Nobel Peace Prize is far beyond his reach. Writing in Investor’s Business Daily last week, Moore said Trump’s economic achievements have been overshadowed by reports regarding his erratic and “dangerous” behavior. As his foreign policy runs wild, Trump also broke political ranks with the rest of the world when he decided to unilaterally recognize Jerusalem as Israel’s capital in open violation of a Security Council resolution calling for the warring parties to decide on the future of the disputed city. Trump triggered a global backlash last year when he singled out Haiti and African nations as “shithole countries” eliciting protests from the 55-member African Union (AU). But running notoriously true to form, he has reversed himself again and again — and denied making any of these statements, despite credible evidence. 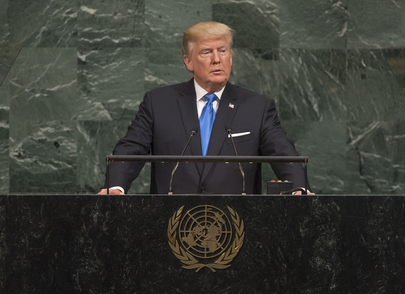 Mouin Rabbani, Senior Fellow at the Institute for Palestine Studies in Washington DC told IPS that speculating on what issues President Trump will address at the United Nations, and how he will conduct himself, is a difficult task. If Trump sticks to the script drafted by his handlers, which he may or may not do, the United States is expected to focus on its attempts to isolate Iran, he noted. “It’s an interesting choice, given that the JCPOA is an international treaty that has been ratified by the UN Security Council, that Iran has repeatedly been judged to be in compliance with its JCPOA obligations, and that the United States in unilaterally renouncing its obligations under this treaty stands in open, willful violation of both international law and its obligations to the world body,” he pointed out. Meanwhile, Haley has already held out a threat on US funding for the UN when she said “We will remember it (the voting against the US) when we are called upon once again to make the world’s largest contribution (22 percent of the regular budget) to the United Nations”. Solomon told IPS the U.S. government’s contempt for international law, humanitarian priorities and the United Nations as an institution has reached new overt heights during the Trump presidency. But governments should do more than directly push back against the dangerous militarism and implicit racism of the current U.S. administration. Members of the UN should also assess — and fundamentally change — the trajectory of the world body’s subservience to the U.S. government and its long-term consequences he noted. During the last few decades, while several different individuals have been in the White House, the U.S. government has engaged in de facto bribery, blackmail and other devious methods to manipulate member states — sometimes using very heavy-handed tactics to induce members of the Security Council to endorse or at least not oppose the USA’s aggressive military actions and ongoing wars, said Solomon. Most permanent and rotating members of the Security Council have too often served as silent partners, rubber stamps or outright complicit assistants to the U.S. government’s flagrant, destabilizing and deadly violations of international law. Yet the undue efforts to go along with Washington’s policies during the last several decades have disfigured the noble ideals of the United Nations — all too often twisting them into rationalizations for enabling the United States to claim the UN’s acquiescence, he declared. Watching Trump preside over a UN Security Council session, which includes an obligation to respect its procedures etc. will be a sight to behold. It’s entirely possible that he will open the session with an offer to remodel the building on the basis of one of his special discounts, and request that his fellow UNSC members adopt a resolution to dismiss Special Counsel Robert Mueller, said Rabbani. If he does stick to script, and insists on pursuing the Iran agenda, one can think of a number of UNSC members that will provide pointed responses to the US position, and these may include US allies as well. There appears to be a growing realisation that the US agenda is not limited to individual objectives such as the destruction of the JCPOA or ensuring permanent Israeli supremacy over the Palestinian people, but rather has a core objective the dismantling of international institutions, particularly those concerned with international law, and replacing these with naked power, primarily US and Israeli, as the arbiter of international affairs. This agenda, he said, also helps further explain recent funding decisions taken by Washington vis-a-vis UN institutions such as UNRWA, though there are clear ideological factors at play as well. “What we recently witnessed with respect to UNRWA and the ICC may prove to be just a precursor to what is coming,” warned Rabbani.